Alan Mulally, CEO of Ford, recently commented on the future of his car company and made a statement that most motorheads would have thought inconceivable a matter of months ago. Mulally said that a key portion of Ford’s future plans center on “more and more electrification, both hybrids and battery electric vehicles.” In addition to that, he also made some predictions as to when the Blue Oval would be in the black. The Ford CEO said that the automaker is on path to be profitable by 2011. If he was talking about the first quarter, that’s a scant 18 months away. And for a company that posted record losses of $14.7 billion in 2008, and forecast continued losses through the rest of 2009 and through 2010, that’s a pretty amazing thing to say. And something to keep in mind is that Ford is the only American manufacturer to turn down bailout money from the feds. Of course, they were also in much better shape, product-wise than either GM or Chrysler. 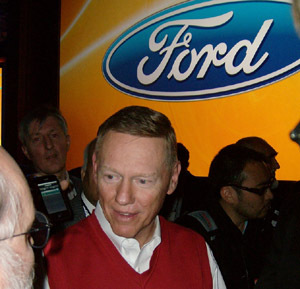 Mulally went on to say that key to Ford’s recovering of profits would be to focus “more and more electrification, both hybrids and battery electric vehicles.” This is interesting on a number of levels, most interesting is that it’s a full-on embrace of both a technology and a mindset that Detroit, as a whole, was scoffing at not that long ago. The remarks were made by Mulally shortly after FoMoCo accepted $5.9 billion in U.S. Department of Energy loans. The loans, which are not to be confused with the bailout loans, are part of the DoE’s Advanced Technology Vehicles Manufacturing program, designed to retool factories to build more environmentally friendly vehicles. Ford approach is to use the government funding to convert two former truck plants into new automobile assembly facilities, as well as fund its forthcoming electric van in 2010 and the electrified Focus in 2011. A change in thinking, and more than a bit of a gamble … one that Ford says will put it in the black soon. Mitsubishi bringing the i-MiEV to the world and that includes the U.S.